AC: I’ll take heat over being a homer and going for upsets. College hockey, I have observed, is a very unpredictable sport, especially when you are talking about single game elimination games. Again, this is what I think will happen, and sadly enough as I have proved all winter, I will likely be wrong….or maybe it will turn around! AF: Before the brackets were released I was thinking Miami winning it all and I liked Merrimack too. When I first printed the bracket out I started write down the winners without looking at who they would play next and it was all top seeds. I don't think it will be all 1 or 2 seeds in the final four. I think there will be some big upsets. You have UNH playing at home, Western Michigan getting good goal tending down the end of the season and UNO with extra time off to play better. Having said that, I am having a real hard time this year with the picks. I never seem to do good with NCAA men's hockey picks anyways. I feel pressure to take the popular picks after listening to how good UND and BC are playing. I think a #1 could go down, maybe Yale or UND, by looking past their current opponent. Once again, the WCHA Final Five displayed high quality hockey in a great arena. The championship game, a 3-2 2OT North Dakota win, was just the crown jewel of this year’s tourney. The absence of the Gophers and Badgers was noted in discussions about the new WCHA when Bi6 Ten hockey starts. Some will say that attendance was good and there is no need to worry, but there are some interesting questions and points that become evident when one digs deeper. How much of the attendance was UMTC fans who pre-purchased the Final Five “season” ticket? The crowd for Thursday’s first game was OK, and then fell off the charts for the second game. Second period of the UAA-CC game was maybe 6,000 (official attendance for Thursday’s single session was 13,131). There was never near 10,000 in the arena at one time by our estimate. The tournament is the cash cow for the WCHA. UND fans arguably have the greatest numbers of fans who travel to the Final Five. Can they be relied upon to carry the ticket load? Can a new WCHA afford to rent the Xcel Energy Center for three days? If the fans don’t come in large numbers, the league cannot possibly pay for the premier arena in Minnesota. A solution might include making the tournament into a traveling venue to school arenas. But that too would likely not bring in the money that the WCHA needs to run. Another solution would be to make the tournament smaller, a four team tournament, and add back in the third place game. Every other 12 team conference has a four team tournament, some with and some without the third place game. The third pace game ensures two games for each team and would likely increase traveling fans. Who will televise the tournament and will they pay as much for the rights? Right now FSN televises the tournament which is natural because they also televise the Gopher games. Take out the Gophers and what do you have for television? It is doubtful that a network will pay as much to televise a tournament without UMTC and UW in it. A main reason to create the Bi6 Ten is for more usage of BTN (Big Ten Network). Will the Gophers be exclusively on BTN for Bi6 Ten games? Will FSN cover college hockey anymore? The landscape of college hockey will change when the Bi6 Ten forms. How exactly it will affect the new WCHA is still in the questions to be answered. It will be interesting to see how the WCHA morphs its identity and eventually its tournament to succeed in the new landscape. The next season, the season that UMD has waited for all year, will start this Friday. The Bulldogs drew Union for the first round of the NCAA Tournament in the East Regional. The other game Friday in the East is #1 overall Yale versus Air Force. There is plenty of time to digest and break down the Region, but at first glance, it looks like a favorable draw for UMD. Now they are taking on the ECAC regular season champion Union in the first round with the likelihood of the winner facing the ECAC playoff champion Yale Bulldogs the next day. But look at the conference that these teams play in, the ECAC. The best news is that the games will not have ECAC referees who love to call EVERYTHING as evidenced in the UMD – Clarkson series earlier this year where power plays were 13 total in the first game and 17 in the second. The total penalty time in the series was 165 minutes. And these are not penalty magnet teams on average, it is just the way ECAC referees are known for calling games. Now I know that many out there will say that these teams have earned their spots regardless of the conference that they play in and those people are correct. Win your games and let it shake out from there. And let us say that the flight out east will not be a downer for UMD. If the Bulldogs of UMD are serious about making a run, this looks to be the best region to do that in. Here is the beginning of a return trip to Saint Paul and the X, but is time for a Frozen Four. Full NCAA Bracket from CHN. Waiting and reflecting. Items on the Bulldogs fan’s to do list, along with get outside because the snow is retreating. But the Final Five goes on with out any maroon and gold. Friday’s games went as expected. Denver had little trouble with Bemidji who had “67 minutes taken out of our tank” tonight according to coach Tom Serratore after Thursday’s win over UMD. North Dakota did get a lift from getting Danny Kristo back from injury and needed all of it to take down CC 4-3. Kristo scored the first goal of the game, welcome back. With the way things are shaking out, the WCHA could quite conceivably have five teams in the NCAA Tournament: North Dakota, Denver, Nebraska – Omaha, Minnesota – Duluth and Colorado College. That is the way PWR may have it, but the committee may not want that many from one conference. CC is likely the last entrant from the WCHA if five are taken. Total attendance to the new Final Five will be interesting. When the final numbers come out, we will give our opinion about where the Final Five and WCHA are headed. Tonight Denver takes on North Dakota for the Broadmoor Trophy. It might be good for UND to lose one, but maybe they don’t have to. Maybe they can just keep winning all the way back to Saint Paul and the National Championship. That would be 13 wins in a row, and that could prove difficult for any hockey team. So let’s keep it short and say that the Sioux will win their second straight Broadmoor Trophy. It was a great Bulldog weekend. A sweep, the first at AMSOIL, against Saint Cloud leaves fans confident that Sandelin has his team ready for a post season run. More importantly, it is nearly a cinch that UMD has achieved the NCAA Tournament. See more and check it out for yourself on the PWR Predictor. The Final Five, going forward, is to hone playoff skills and better the Bulldog seeding for the next tournament. In a few words, the one-loss-ends-your-season days are over. We look forward to seeing what this UMD team can do seeing the best of the WCHA again, now in Saint Paul. Bi6 Ten? The only future Bi6 Ten team still alive and playing is Michigan. And the Wolverines are the only of the six that can and will be playing in the NCAA Tournament. Now when the Bi6 Ten starts, they will have an auto-bid. Now if there were such a tournament to crown a Bi6 Ten Champion, would college hockey pundits be debating the validity of a conference with one team deemed “good enough” by the PWR for the NCAA Tournament? The CHA on steroids? No, but definitely an eye opener for new conference proponents. The new 12 team WCHA makes its playoff debut this weekend. The questions at the start of the season centered around how a 12 team league would shake out. The results are that the teams, at least for this year, are all very even. All teams outside of North Dakota and Michigan Tech have been up and down all season. All home teams could win this weekend or all road teams, other than Tech, could win this weekend. The teams are that close. These two teams just met last weekend in Houghton, Michigan. The next meeting will result in North Dakota making it to Saint Paul. Tech this season is just outmanned by all WCHA teams and holds especially true against the Sioux. How many goals will UND score this weekend? Can they best the 17 goals from last weekend? North Dakota in two games. MSUM has shown streaks of promise throughout the second half of the season starting with their championship in the Shillelegh Tournament. Meanwhile Denver has played well enough down the stretch to lead a pack of three teams separated by three points to claim #2. “Well enough” means just that, Denver gave UMD and UNO every opportunity to take second when the Pioneers lost to UMTC, UNO, SCSU, and Michigan Tech. Denver will take advantage of home ice and deeper talent on the blueline to take this series in two games. This series marks the first time in the WCHA playoffs for both teams. It is also was one of the most unlikely pairings at the beginning of the season as media and coaches picked both to be in the bottom half. But the biggest surprise of the new WCHA is the UNO Mavericks being very competitive, except when they played BSU this season. Bemidji does seem to have Omaha’s number this year, but there are key questions to the series results. Will BSU goaltender Dan Bakala be on his game and will forward Matt Read be ready to play after his injury? Those answers won’t be known until game time, but it really won’t matter in the final outcome. UNO will defeat BSU, two games without Read and in three games with Read in the lineup. This series is being talked about as maybe the best opportunity for a road team beating the favorite. It is not hard to see that with SCSU playing some good hockey, albeit against some teams that aren’t on real hot streaks like Wisconsin, Tech, and Denver. The other factor is UMD’s disappearance of two game winning streaks. UMD has not won two in a row since sweeping Michigan Tech January 21 and 22. Luckily for the Bulldogs a two game sweep is not needed in a best of three series, and UMD has needed all three games in their last three home playoff series. It will be an exciting series, it will take three games, and it will be the Bulldogs going to Saint Paul. There is still a lot of buzz concerning the 1-0 UAA win to end the series between the Gophers and Seawolves on January 29. The Gophers were taken to the wood shed physically and were beat up. They weren’t happy with the officiating or the way UAA took it to them. Did the Seawolves send a message or did the Gophers answer the bell as shown in the fighting penalty taken against Tech two weekends ago? It will be a physical series. UAA should be able to shut down the Gophers for at least one game, but can they win two? This is the series that is most likely to go to a road team due to UAA’s physical play and the ups and downs of the Gophers. Anchorage in three games. Another series that was previewed last weekend that pits a mediocre CC team against a downward spiraling Wisconsin team. Some have jested about Tech “tanking” to get North Dakota’s confidence up and their guard down. This is a series where maybe CC didn’t want to win last Saturday because they had home ice locked, couldn’t move up and a Badger win would most likely send them to Colorado Springs. The Badgers couldn’t have been much worse coming down the stretch run going 1-6-1 with the win against CC to ensure they would meet again. Of course the joke in this is that SCSU could have passed Wisconsin if they would have swept Denver. But really, CC gets a good draw and should get past the Badgers in three games. To sum it up, we may have a record number of three game series for the WCHA if the predictions come true. In the new era of the expanded WCHA, many of the teams are not separated by much and none outside of North Dakota are really on a solid roll against good teams. This will be an interesting experiment handling a 12 team league in this format. It will likely be a wild and surprising ride to Saint Paul and the Final Five. A win does a world of good. UMD beat UNO convincingly 4-1 last night at AMSOIL Arena. The Bulldog win was the first Friday night win since January 21 at Michigan Tech. It was the game Bulldog fans were waiting for. It was a complete game with great effort in all facets of the game. The win really a statement that the team is back and focused on the end of season and the prize that lies beyond. Kenny Reiter played an excellent game in net for UMD making 34 saves on 35 shots. He should get the nod in tonight’s game. In front of Reiter, the whole team did their part to play defense to make his job easier. Travis Oleksuk led scorers with two goals, including the game winner, his team leading 7th of the season. Oleksuk’s linemates JT Brown and Kyle Schmidt both picked up two assists on the night. The brightest spot for the game is how UMD went “off-script.” The Bulldogs have been a team playing from behind early in games for much of the season. Taking a 3-1 lead out of the first period was the start that set the tone for the game. The Bulldogs have also relied heavily on the first and second lines for goals. 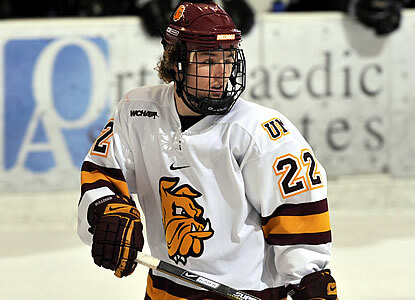 In Friday’s game UMD got their fourth goal from a hard working fourth line wing, David Grun. The more that the third and fourth lines play good defense and chip in scoring, the further UMD will play into Spring. The win temporarily flip-flops UMD’s and UNO’s PWR rankings. The Bulldogs take over #8 and the Mavericks fall to #11. What to look for tonight. UMD can’t be expected to do much more than Friday night. A win or tie keeps UMD ahead of Omaha in the playoff picture. A Bulldog win coupled with a Denver loss or tie moves UMD into second for the playoffs and lines them up for the added bonus of a possible bye at the Final Five. Home Ice is Locked. With the UMTC tie and CC win last night, those two teams locked up the last two home ice spots for the first round of the playoffs next weekend. A turning point in college hockey is on the horizon. Big Ten is coming (Bi6 Ten?) reportedly for 2014-15 season thus changing the landscape of the WCHA and CCHA. Without the “money makers” of Michigan, Michigan State, Minnesota – Twin Cities and Wisconsin not traveling to the smaller schools in the conference, teams are looking at dropping programs. One of those teams hinting at the possibility in the near future is Michigan Technological University. Michigan Tech has been in the bottom of the WCHA for years. It is easy to wonder why they even ever had a team, a school way out in the hinterlands. Who would want to go there? For those newer to college hockey, you need to know that Michigan Tech has a storied past. The Huskies won the NCAA National Championship on three occasions, 1962, 1965 and 1975. The 1975 win was sandwiched between two second place finishes, both at the hands of the UMTC Gophers. Michigan Tech will be hosting a current hockey power this weekend in North Dakota. It will be the weekend that UND receives the McNaughton Cup for the WCHA Championship. 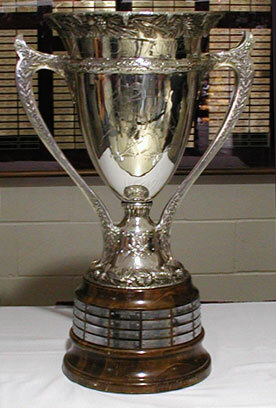 The cup is one of the most storied in college sports and Michigan Technological University is the trustee of the cup. Michigan Tech has not had it in their possession for years, not since 1975-76 season. But the cup should be making an appearance in Houghton this weekend, another sobering reminder of hockey traditions lost and the current teams the Division I ranks may be losing. In Duluth. This weekend Omaha is making its only trip to Duluth this season. There is a lot riding on the two game series. Foremost, the winner of the series will better the other in playoff seedings. It is also the last chance to get “on track” for a playoff run, and what better team to play than one just higher than UMD on the PWR. New Digs Neutralized. AMSOIL Arena is beautiful. The players, coaches and fans love it. But it isn’t the DECC. The Bulldogs are 9-4-2 at home this season, but just 2-3-2 at the new arena. The Mavericks of UNO are 7-8-1 on the road this season. 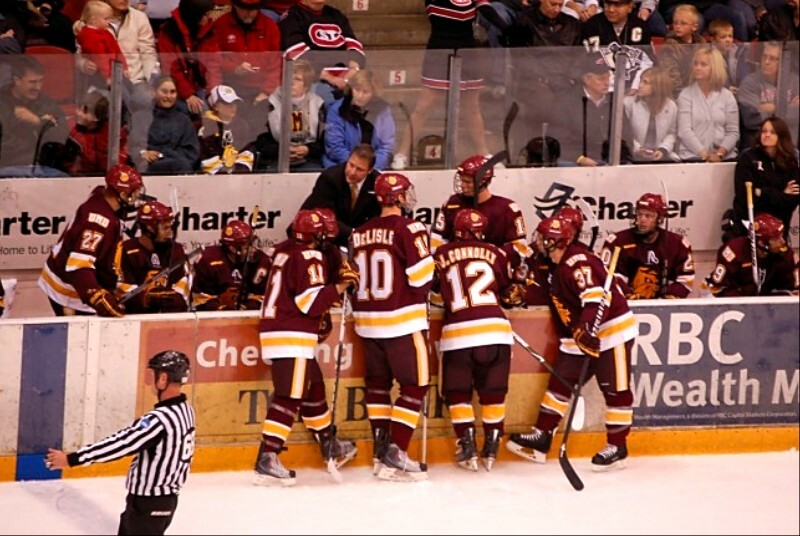 Its Been Rough, But… The Bulldogs have the least number of overall losses (8) out of all the WCHA teams. Unfortunately, seven of them have come in league play and that is why UMD is fourth in the WCHA. The last time a Bulldog team finished with less than 10 losses was the 1992-93 team. Will the goalie rotation continue? We still look for Reiter to become the number one. Will the team play defense? It is more than just the goalie and defensemen; it has to be everybody doing what they can. End the Friday hex, and heck, even get sweep. A sweep and a Denver stumble can still get the Bulldogs into the coveted second spot. But it all starts with two well played games which UMD wins. Outcome. This will be a good test for the Bulldogs, or maybe a bad one if they fail. Regardless of the outcome, UMD will get a taste of the playoffs this weekend. And with nothing to lose, fans shouldn’t get worried, right? We do see more of the same happening this weekend, thus a series split. The change we do predict is that the Bulldogs will come to play Friday and win relenting to the Mavs Saturday night. Around the WCHA. It is the last regular season weekend and all teams are playing conference foes. #2 North Dakota at Michigan Technological University: In a preview of next weekend’s first round playoff series, North Dakota sweeps here…along with next weekend too. #19 Saint Cloud State at #5 Denver: I never thought that a ranking would be put in front of SCSU after the start they had, but here they are at #19 in the PWR with a chance, albeit an outside chance, of having home ice. SCSU is playing well and Denver plays well at home. These teams split the series. #14 Colorado College at Wisconsin: This series is not a guaranteed repeat in the playoffs next weekend, but it is a likely rematch in Colorado Springs. Can the Badgers really go eight games without a win? No, so this will be a split and they will play again next weekend at CC. #19 University of Minnesota – Twin Cities at Bemidji State: BSU has a good defense so the Gophers will have struggles at least one of the nights to score, thus a split in Bemidji. Alaska – Anchorage at Minnesota State – Mankato: A difficult one to call with UAA coming off of their weekend against archrival Alaska. The staff is split here; in discussions it was said go with a split, it is the safe pick. I go against the more sound advice and see a MSUM sweep. With all the splits we predict, the standings would stay the same. The only change would be if MSUM does come through with a sweep. That would move them past UAA. It has been a good regular season, but it will also be good to look at the playoff scene next week.